This is my sister’ favourite hand cream purchase. I really love this too but I prefer to use a deeper moisturising hand product so I have left this one for her. Love & Toast has fabulous quirky packaging and this cream comes in a beautiful recyclable cardboard box in pink and white and the cream itself is in a soft squeeze aluminium tube with pink graphics, love heart and screw top lid. The cream has a medium consistency and a whipped texture and absorbs quickly into the hands without leaving any residue or stickiness. The fragrance is just so beautiful! It has a crisp, fresh citrus scent with definite sugar. For me its smells like candied grapefruit and it lingers for a long time on the skin. This scent is so addictive! After application your hands feels smooth, soft and hydrated but for me I found I needed to apply again after a couple of hours as the formula is not rich enough in comparison to the creams I usually use. The cream is 97% natural and paraben free and vegan friendly. The Love & Toast brand is not easy to come by and my sister and I first found these products in the SpaceNK store in Bath. We have not found them anywhere else but online since. They are not cheap products but they have rather unique and innovative designs and fragrances and at the moment our family is addicted! 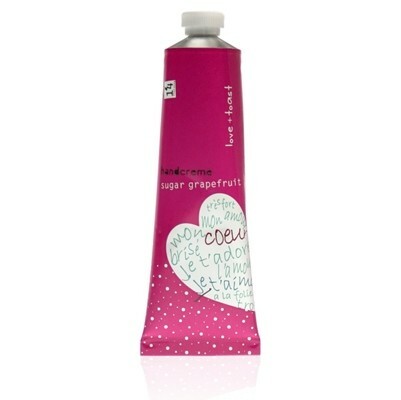 "This is my sister’ favourite hand cream purchase. I really love this too but I prefer to use a deeper moisturising hand product so I..."